The Rose Bowl has extra meaning this year when Ohio State faces Washington. Urban Meyer is coaching his final game at Ohio State and his announcement caused the line to move in the Buckeyes' favor. Ohio State opened -4.5 but news of this being Meyer's final game moved the line two points at most sportsbooks. The Rose Bowl has extra meaning this year when Ohio State faces Washington. Urban Meyer is coaching his final game at Ohio State and his announcement caused the line to move in the Buckeyes' favor. Ohio State opened -4.5 but news of this being Meyer's final game moved the line two points at most sportsbooks. Oddsmakers won't be sad to Meyer go. He's killed them over the years. 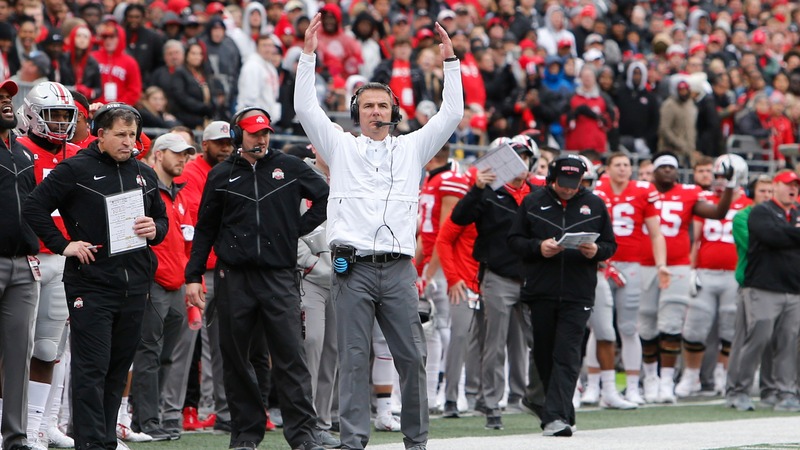 In his coaching career, Meyer is 123-89 against the spread overall and 9-3 against the spread in bowl games. He has covered in four of the six bowl games he has coached for Ohio State. Ohio State finished the season strong winning five straight games, including a 62-39 thrashing of rival Michigan. The Buckeyes were 3-2 ATS in those games and 6-7 ATS on the year. Ohio State was at its best late in the season, outscoring Michigan and Northwestern 107-63 Washington was a dismal 4-9 ATS but closed out the season with consecutive covers in wins over Washington State and Utah. Books will be hoping the Huskies can keep that ATS run alive on New Year’s Day with most of the money from both the sharps and public coming in on Ohio State. If you like to bet the UNDER, Washington is your team. The Huskies were 10-3 to the UNDER this season and the UNDER is 5-2 in washington's last seven games. ## Washington vs. Ohio State betting lines __Point Spread:__ Ohio State -6.5 __Total:__ 57.5 __Line movement:__ Ohio State (12-1) opened as a 4.5-point favorite over Washington (10-3) at CG Technology and many other sportsbooks. Once head coach Urban Meyer announced he would be retiring after the Rose Bowl, the spread jumped two points to -6.5. It was either 6.5 or -7 at most books as of Dec. 26. The total opened 58.5 at most books and hadn't moved much. It was either 58 or 58.5 at most shops before falling to 57.5 the day before the game. ## Washington betting overview __SU record:__ 10-3 __ATS record:__ 4-9 __O/U record:__ 3-10 Washington (10-3) won its second Pac-12 championship under Chris Petersen, and the Huskies are led on offense by four-year starter Jake Browning and the school's all-time leading rusher in Myles Gaskin. Gaskin has rushed for 1,147 yards and 10 touchdowns this season. The Huskies have won four straight and are playing their best football of the season. Washington has been led by a defense that's given up just 18 points combined in its last two games. The Huskies are also the only team this season to hold Washington State quarterback Gardner Minshew without a passing touchdown. Washington ranks fifth in the FBS in scoring defense (15.5). ## Ohio State betting overview __SU record:__ 12-1 __ATS record:__ 6-7 __O/U record:__ 7-6 The Buckeyes have the No. 2 passing offense in the country and the No. 2 total offense (548.8 yards per game). Ohio State's offense is led by Heisman Trophy finalist Dwayne Haskins, who ended the season with 4,580 passing yards and 47 touchdowns. Haskins really turned it on late in the year. In his last two games against Michigan and Northwestern, Haskins threw for 895 total yards with 11 touchdowns and only one interception. The Buckeyes rank eighth in scoring offense, averaging 43.5 points per game. Washington's third down defense will likely play a crucial role in this game. The Buckeyes rank 10th in the FBS with a 48.2 conversion rate on third down and Haskins has a 163.4 passer rating on third down this season. Meanwhile, the Huskies rank No. 65 in third-down defense. If Washington's defense can't get off the field on third downs, it will be a long day for the Huskies. __Play and Win:__ [Sign up for our free contests](https://betchicago.chalkline.com/) ## Washington vs. Ohio State trends UNDER is 9-1 in Huskies last 10 vs. a team with a winning record. Huskies are 1-4 ATS in their last five non-conference games. Buckeyes are 4-0 ATS in their last four vs. Pac-12. Buckeyes are 8-2 ATS in their last 10 neutral site games. ## Washington vs. Ohio State pick Washington has a strong defense but Ohio State will be by far the best offense the Huskies have seen all year. This could be the final game for both Meyer and Haskins and the smart money has come in hard on Ohio State. We'll side with the sharps here and take the Buckeyes as close to a touchdown favorite.